Le Mangii is a well known name. 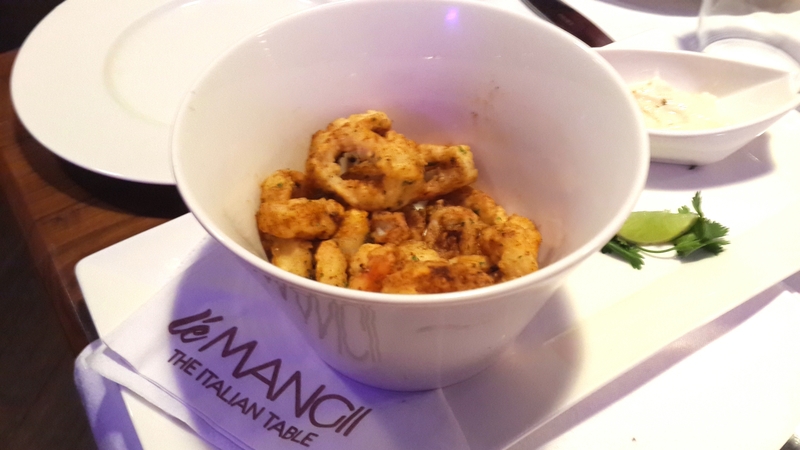 Whoever adores Italian food absolutely loves the food at Le Mangii. 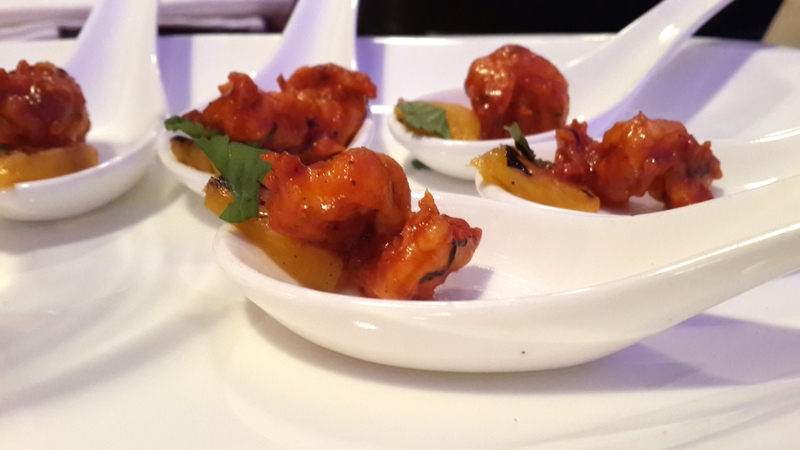 Le Mangii which is situated in the posh area of Juhu scheme, is a perfect dinner spot. I have gone there a few times and have come back satisfied and truly happy. So when I got an invite for the pre – Valentine’s Day bash aka launch party of Le Mangii’s new outlet at Kamala City, Lower Parel, Mumbai. I was thrilled and said yes in like 2 seconds. So hence on 13th Febuary we went to the launch party of Le Mangii. Now obviously the interiors are well done. Simple yet elegant decor is what you see when you enter Mangii. So we entered and I met my fellow foodies and was then showed the table. My excitement just kept increasing and increasing I was hoping to hog on the lovely breads, pizzas and pastas. So started the starters, now just a minute we weren’t given a written menu. So when people come and lay a tray of well plated food in front of me and tell me the dish’s name. All I remember is the main ingredient’s name whether I want to eat that or no and rest of the time the brain is just memorizing what the dish looks like and I need to click a snap !!! So I don’t remember any of the dish’s name but I do remember their main ingredients. So forgive my female fish in Finding Nemo memory. I actually don’t even remember her name. I just remember Ellen DeGeneres gave the voice over. But anyways back to point. When Calamari was served I was impressed. I couldn’t wait to eat it. It tasted nice but then suddenly the night took a turn. A totally inedible substance came out of the calamari which was almost eaten by my sister but thank God she didn’t. As the complain went to the management the owner Mr. Prashant Chaudhari himself came and perfectly apologized. As Mr. Chaudhari really looked sorry about it, we let it go and thought things would get better with better food. But as much I as I was finding reasons to love Le Mangii. Le Mangii was giving me reasons not to. 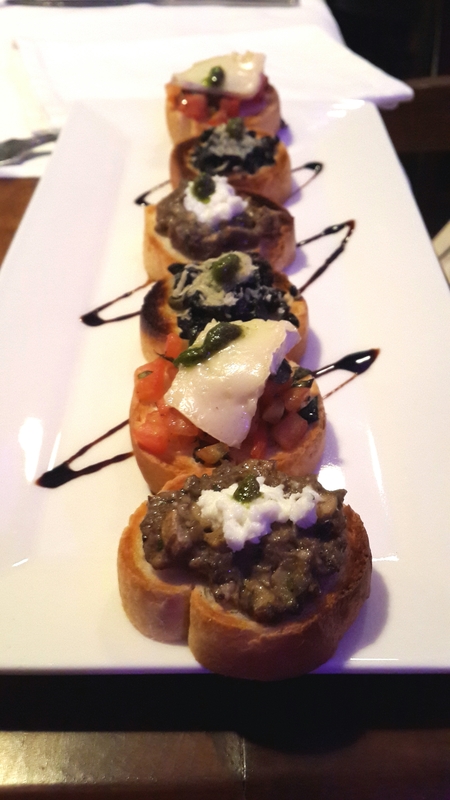 The starters were just okay, some like the bruschetta and the potato dish was nice. 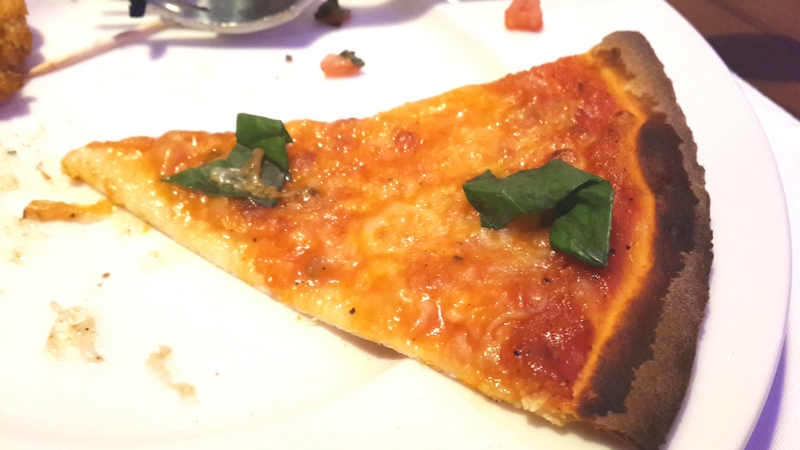 The two slices of pizza that were served were okay. 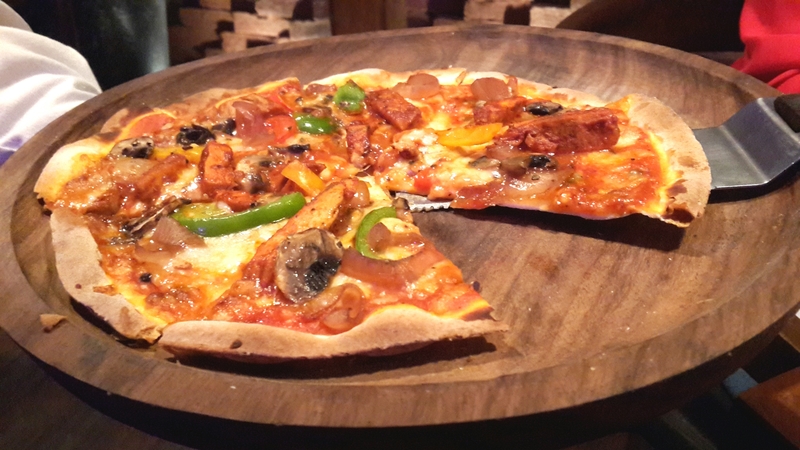 Where else in Juhu the pizzas are delicious. I thought never mind maybe the main course would save it. For the main course I was shown a menu with 5 options and we had to choose one per person. 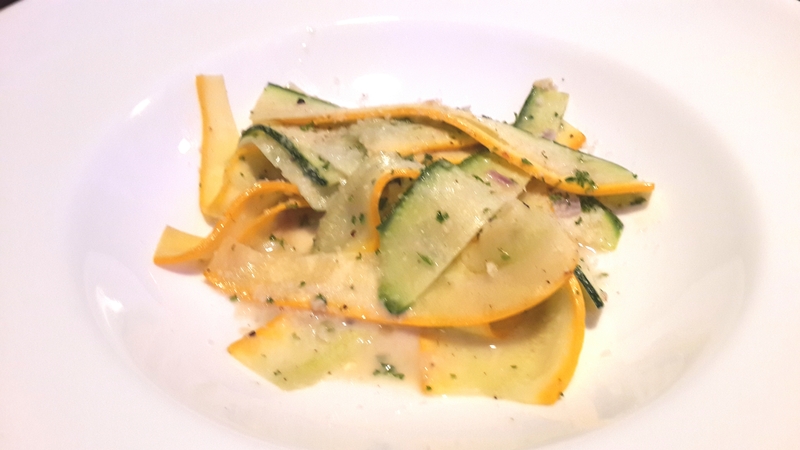 So we chose Zucchini Paperdelle in truffle sauce and Saffron Risotto. We asked them if we could add chicken to it but somehow it wouldn’t have gone with the taste and they declined. So the dishes came after a long wait. I don’t want to be mean and harsh over here so I will just say one thing NOT GOOD. 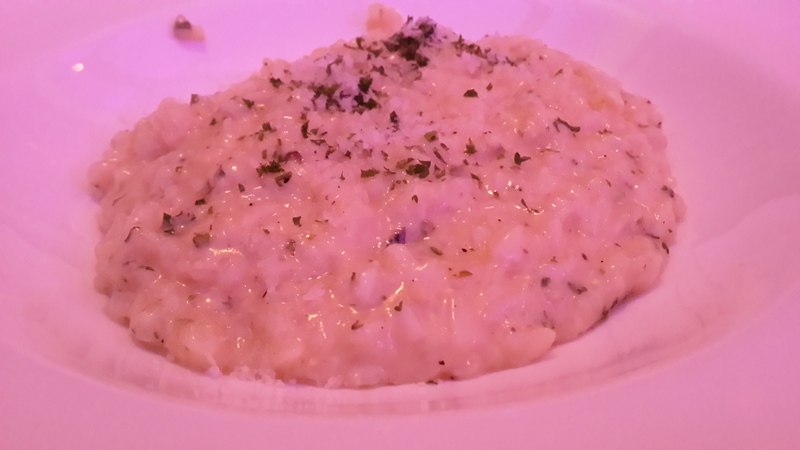 I have one complain – Why didn’t I see a proper pasta in an opening of an Italian restaurant ? I guess its all and all the fault of whoever made the menu for the night. He/she seriously edited all the good dishes and served all the bad ones. I really hope that Le Mangii keeps its standard and serves similar food to what is served at the Juhu outlet, because I know they can do better. Yes, that’s very strange. An Italian restaurant is not Italian without pasta, here in Sicily we eat pasta twice a day. Mangii reminds me of the time I went to Japan (my husband is Japanese) and my relatives served us Japanese sweets. They kept saying Mangiu, Maniu, so my mother and I thought they were telling us to eat. Then my husband said Manju was the name of the sweet!